This page illustrates the teams released by Edilio Parodi in 2002, and then goes on to explain about the 2003-04 range, which featured over 100 new kits, as well as a new figure and base type. The two pages that follow illustrate all the teams from the 2003-04 range (as far as I am aware). Part 1 - The 2002 Range. Parodi got the ball rolling by launching a four page flyer, featuring old Hasbro items. This included many common accessories, and eighty-six old teams, mostly from the final large Hasbro range of 1996, plus some from later ranges (like the 1998 French sides). Then in the summer of 2002 new hand-painted teams started to appear. These were mainly versions of existing 1996 kits as shown in the 2002 catalogue, and were probably a way of fulfilling demand for teams whose stock had been exhausted. The finish on these teams was the thick paint associated with Zëugo. In all, fourteen sides appeared in this hand-painted form. The most interesting of these was a solitary addition to the range, Serie A newcomers Cheivo, whose recent heroic rise up the Italian leagues meant that they had never been produced in Subbuteo before. The final Hasbro numbered team Parodi was selling was 63826 Werder Bremen, so Cheivo were put on 63827, even though this had previously been used by Grasshopper Zurich. Other sides of interest are a new look "Puma" kit for Lazio, and a lovely Roma with white shorts and more accurate colours than the old Hasbro version, which was still based on the 1983 Scudetto winning side. These teams were sold in the standard green boxes of the Hasbro range. Part 2. The 2003 Range. Edilio Parodi's eagerly awaited new range arrived in mid 2003. This followed the new Parodi box set, which featured new playing figures, new bases, and a lovely new team box. The box set also confirmed that the new teams would be hand-painted. The new range was previewed with illustrated figures like the Subbuteo catalogues of old. The initial range was ambitious, with 115 teams, plus an unpainted side for the many people who prefer to paint their own kits. The range covered the whole of Serie A (with away kits for some of the bigger sides), the whole English Premiership of 2002/03 without away kits (or Charlton oddly), most of the teams from the 2002 World Cup, plus a decent number of other top sides from the rest of Europe and further afield. Fenerbahce - Parodi painted lightweight. When the first teams arrived, it became clear that the majority were not going to use the new players or bases. Approximately two thirds of the teams released were a repeat of the 2002 style with thickly painted lightweight players, Hasbro bases, and green boxes. Clearly, there was still a lot of old stock to use up. Still, some of these teams were attractive enough, and feature a few sides who had not appeared in Subbuteo before. About a third of the initial range (38 teams) did come in the new style. These sides came in attractive black boxes with a black tray to hold the figures. These boxes look great, but do have the same problems that Hasbro ones do. The tray hits the bottom flap, and once this is bent, you can't get the damn tray to go in. The other niggle is that to squeeze in spaces for ten players, plus the two windows and the central area leaves everything a bit tight. So the player's heads stick out of their spaces. The players themselves are a new design which doesn't quite match the figure in the Parodi box set. Basically, they had a couple of tweaks. Most noticeable is the removal of the visible short-sleeve lines, although stupidly the box set teams were painted with long sleeves, whereas on the new teams the sleeves were usually painted short anyway. The less obvious, but more crucial fix is that the ankles were thickened and were therefore stronger. This was one of my concerns with the box set sides, but the new teams seem fine. As part of this change, the legs on the new figures also seem to be straighter. The goalkeepers in the new sets were the 1970s Subbuteo design that had been reused in Zeugo and the box set. These are much stronger and better than the thin Hasbro 'keepers who still featured in the green box teams. The black box goalkeepers had black rods, which were different to Zeugo ones (which are blue) and the boxed edition ones (which are green). The bald and pony-tailed players from the box set did not appear in these sides. Another odd decision with the new teams was that the new two part bases were initially only produced in all-white, probably due to production costs. There was some logic for these bases being white. For some reason, Hasbro had produced very few teams on white bases. Leeds were either on yellow or blue, and Real Madrid were on claret. Indeed, the white Hasbro bases were nicknamed "white-gold" in playing circles, because of the difficulty in obtaining them. For this reason, none of Parodi's Hasbro based sides would be on white, and so the new teams wouldn't clash with these sides. Of course, they would clash with each other, and herein lies the problem. Especially in cases like England, where home and away kit were in the new figure, and so both sides were on the same colour. In most cases, if a kit was predominately white, that team was painted onto the new figures rather than an old Hasbro, but again, this was not always the case. Real Madrid's all white kit sits on old claret bases, whereas their black away kit is on new white bases. This decision to split the range was based on cost, and the need to get rid of the old Hasbro stock (especially the bases). But it really required a little more thought. If the Hasbro based sides had been used for lesser teams, or a cheaper less-detailed "kids" range, this would've made more sense. Instead, there is no logic at all. For example, the Juventus home kit was produced in the old figure, and their away kit is in the new series. Whereas Lazio are the reverse. Their home kit is "new", and the away kit is "old". In the English league, giants Man Utd are an old team, whilst Birmingham and West Brom are among the new. Looking at the World Cup teams, Brazil are "old" but Uruguay are "new". You might think that producing 115 teams in a single year would be plenty, but this was only the first batch. Other sets of teams appeared through the year. The first different sides to appear were the "specials" from Internet retailer World Table Soccer (WTS). They asked for eleven different teams, and thanks to a little funding from WTS, these were the first new teams to be produced with matching two-colour bases. The teams were also nicely painted, and were one of the highlights of the year. Sadly, it was announced in December 2003 that Parodi's licence to produce Subbuteo was not being renewed by Hasbro, and production would therefore shortly cease. 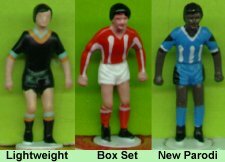 Whilst Subbuteo fans were still taking in the news, a further new batch of Parodi teams arrived. The initial part of this range was ten Scottish teams to complete the Scottish Premiership. Again these teams had matching two-colour bases, but they also saw a return for the bald and pony-tailed players. Here they are not only the tweaked player type, but they are also painted up to be the two coloured players in each team. The range was further enlarged with the teams promoted to the English Premiership at the end of last year, Leicester, Wolves and Portsmouth. Other teams from the initial range have also been reissued. Some made the leap from Hasbro to Parodi type players, some received new kit, and some just new base colours. As mentioned above, Parodi announced in December 2003 that their licence for Subbuteo production was not being renewed for 2004. This new came alongside rumours of a Hasbro relaunch (perhaps for the Euro 2004 championships). However, Parodi were going to keep selling their teams until told to do otherwise, and by March it had been confirmed that the Parodi licence was to continue in 2004. This allowed Parodi to restock their team range, and teams which had sold out were made available once more. The good news is that where teams were previously on the old lightweight players, they were now being issued on the new Parodi figure and base, giving a more uniform feel to the range. The new two-piece bases were provided in a variety of colours across the range, and it was nice to have the choice of two colour bases once more. Initially, Parodi did not add anymore teams to their standard range, although a few teams like Juventus, Milan and England received updates to their kits. Instead, they providing more specials to individual sellers. The bulk of these were to Subbuteoworld who added a choice of US Major Soccer League teams, and a few limited editions for their Subbuteo Club members. Other specials were due from other sellers, like "That's Magnificent", but sadly Subbuteoworld negotiated a UK exclusive, which prevented them (or World Table Soccer) from getting any other specials. Eventually though, many more teams came from Italy, and I'll summarize the final confusing period of this range at the end of this section of the site. Head to the 2003-04 Parodi Range Part 1 to look at this range, unless you want to look at the specials and late-comers in which case you could jump straight to the 2003-04 Parodi Range Part 2.